There is a ‘joke’, (I use the word loosely) that the Queen thinks everywhere smells of paint. That’s because twenty feet ahead of her there’s a fella painting the railings, the walls the roads… OK, old joke, not funny. Where I live it seems the railings are,literally in some cases, being painted and not for a visit from the Queen. 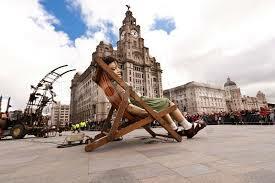 I live next door to Newsham Park in Liverpool, and next month, 23-27 July, the Giants will be in attendance! My area has been getting spruced up for the visit. Tue Brook has been going down hill for a long time mainly due to lack of investment, sometimes it feel like we get overlooked. Yet something like this perks its up! Roadways are being maintained,empty shops are being rented out, ( not just to fast food places or hairdressers!) and an empty library I’ve written about on here previously, has been recommended to become a community hub, whatever that is, but at least it’s going to be used rather than rotting away. Things seem to be – very slowly – changing, despite my cynicism for the better. I had a bit of a panic yesterday, just a small one. I saw a countdown on the news, time ticking to when, MY PC WILL BE HACKED AND MY LIFE AS I KNOW IT WILL BE OVER. I would like to say I’m being dramatic but I’m not. That’s how it came across. There is a computer virus that has been unleashed, it will remember your keyboard depressions, access your bank accounts and other personal details. According to the news 15,500 computers will be ‘diseased’ in the U.K. alone and it will probably be an e-mail from a friend that will pass it to you. So, don’t use your computer…and don’t have friends. I watched eagerly for a solution, by now I was imagining all kinds of scenarios. I remember the ‘Millennium Bug’ ! Planes were going to fall from the sky and we had to stock up on bottled water and dry goods because, according to the news, THE WORLD WAS GOING TO END! And all because there wasn’t an extra ‘0’ on your PC’s internal clock. Hmm. Don’t get me wrong, I feel sorry for the business that lost £100,000 to this virus, I’m not knocking the seriousness of it. It’s horrible to be hacked, I have been, as many, many others have no doubt. Its the equivalent of some scumbag getting into your house wearing a ski mask and waving a baseball bat,well it was for me. So, I eagerly waited to find out the solution. I waited and waited until at the very end of this news section the reader told me how to save my self, “Download extra firewalls and visit this site and download some extra BLAH BLAH BLAH”. So after all the scaremongering, the way to stop this was given just as an aside, she may as well have winked and given a thumbs up! I screamed at my fella to take note and do this…now! (He hasn’t yet) My computer knowledge is somewhere between being a champion ‘Pong’ player in the 70’s, and just getting to grips with Twitter and this very blog thirty years later i.e. Rubbish.Sketchy at best. I have tried to learn stuff but as soon as bites,usb, techy language is mentioned, my eyelids begin to flicker and the old TV test card image just sits in my head. So I do my best. I try not to panic. “It’ll pass!” I tell myself… fingers crossed.